Displaying Heather Robinson’s first-place winning design are (left to right) Robin Blair, IIDA’s co-vice president of student affairs, Heather Wilmot, IIDA Philadelphia City Center Planning Committee member, and Heather Robinson, PhilaU interior design senior. 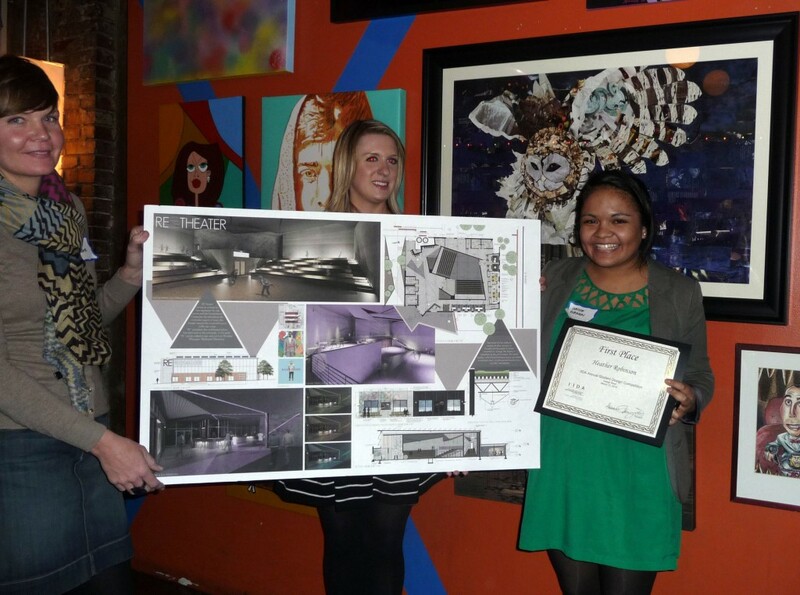 Philadelphia University interior design seniors won the top two prizes and an honorable mention in the 2014 International Interior Design Association (IIDA) tri-state chapter’s annual student design competition. Heather Robinson won first place, Emma Rosenwinkel took second place, and Colleen Barry earned honorable mention for their innovative designs for a community theater. This is the fourth consecutive year a PhilaU student has earned first place in the IIDA student design competition for Pennsylvania, New Jersey and Delaware. The competition, open to all student IIDA members enrolled in interior design programs in the tri-state area, required participants to submit a floor plan, elevation or section, and perspective drawings from a project completed in the last year. Projects were judged on effectiveness of design solution, creativity, craftsmanship and overall presentation. Heather Robinson’s winning theater design features retractable bench seating for performance space flexibility. 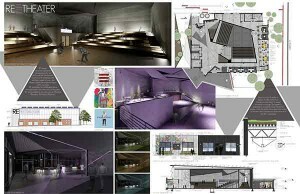 All three winning PhilaU students submitted projects from a fall 2013 assignment to design a performing arts theater for Philadelphia’s Germantown neighborhood, including a focus on auditorium, stage, lighting and acoustical design, as well as sustainability and building codes. Robinson’s first-place design, “RE Theater,” included a performance space for rap music. Her design drew inspiration from the multi-faceted culture of the surrounding community and features retractable bench seating to allow the traditional performance space to transform into a club atmosphere.